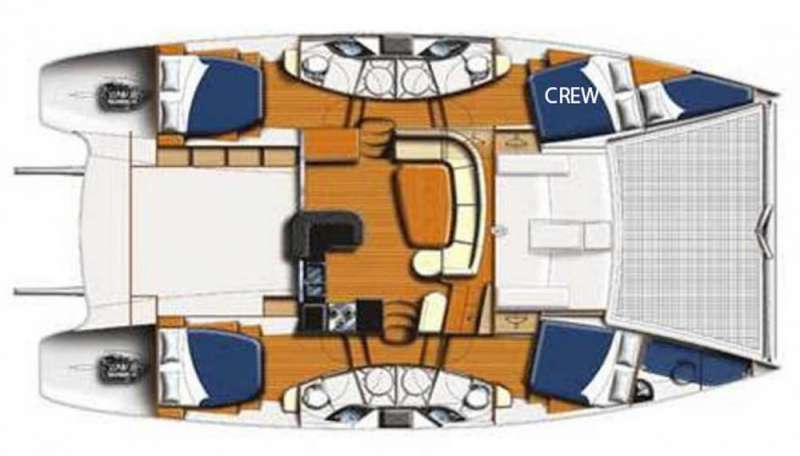 Communicate: Onboard WiFi available in USVI and BVI, limited to email useage only please. Streaming not allowed. Jason and Brenda Clay realized their love of exploring the Virgin Islands many years ago during an amazing trip to St. John. While sitting on the beautiful beach at Cinnamon Bay, they were watching the boats on the water and it sparked their interest in finding a way out of their corporate careers and into a life full of fun and adventure. 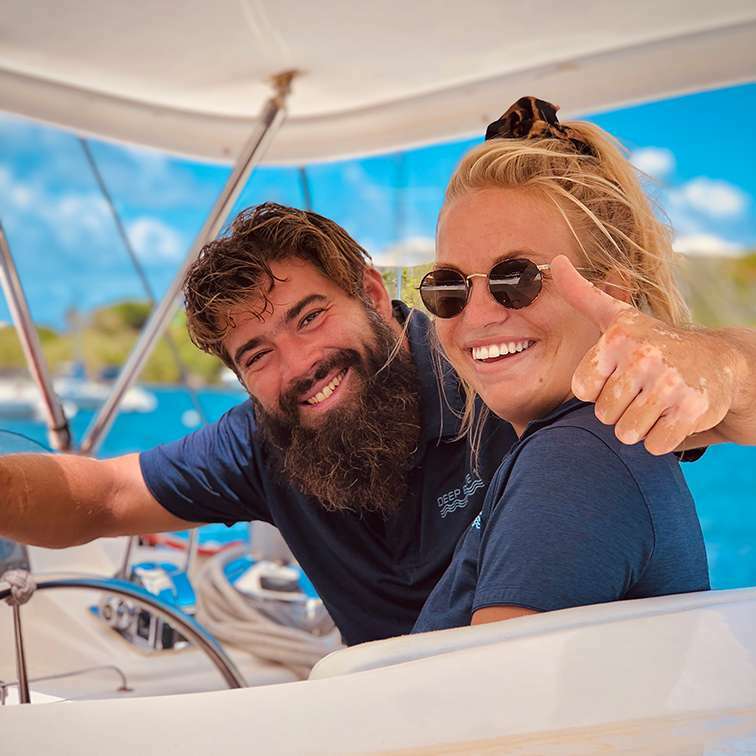 Today they enjoy sharing their love and knowledge of the Virgin Islands with guests on Deep Blue 1 and are excited to welcome you aboard to join in on all the fun the islands have to offer! Originally from the same small town in the foothills of North Carolina, Jason was a successful IT Professional and Brenda was an Executive Event Coordinator. After purchasing their first sailboat, they got married and made a 10 year plan to be charting a boat in the Virgin Islands. They perfected their sailing and entertaining skills while running a successful day charter business during the weekends on popular Lake Norman. Once their two children were grown and successfully out on their own, they sold their house and belongings and moved to Charleston, South Carolina. There they lived on their boat for several years until they could finally escape their land based careers and become island bound. Captain Jason enjoys showing guests the Virgin Islands that are a little off the beaten path. Those special places not many people know about, but are sure to leave a lasting memory. Along with providing guests with an amazing experience, he loves to hike, snorkel, and fish. He also enjoys learning and talking about the history of each island. Captain Jason holds a USCG Masters 100 ton license with Sail and STCW endorsements. While cruising with Jason you can learn how to sail or simply kick back and relax with a tropical cocktail knowing that you are in good hands! Chef Brenda’s Southern hospitality and charm make her the perfect host for a fun and relaxing vacation. She enjoys spending time in the galley making wonderful gourmet entrées using fresh local ingredients. You can enjoy her classic Charleston Shrimp and Grits as well as her signature Caribbean Tuna-Tini! Don’t forget that your taste buds are on vacation too! Outside of the galley, she enjoys paddle boarding, snorkeling and making people laugh. Her warm personality and love of the islands will ensure you have the most amazing time! Let Jason and Brenda help you escape to that once in a lifetime vacation that you have always been dreaming about!